Voice your opinion! Review Mattress Sales now. Very bad moments I have with this company. Is Mattress Sales your company? 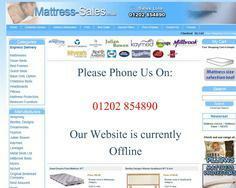 Mattress Sales is a UK Supplier of mattresses and beds, double, single, airsprung, Free Delivery. We supply single or double beds, childrens, hotel mattresses, sale, all with Free Delivery in the uk.